Clippers cut too close to the quick, causing pain! Ordinary scratching posts can cost as much as $100 and they won’t trim your cat’s claws • Your cat can give itself a pedicure! The secret is the Emery Cat™ Board’s patented honeycomb surface that works like a nail file, gently filing away sharpness. 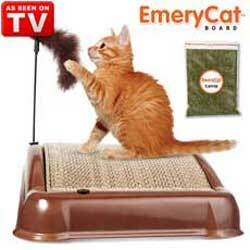 Infused with irresistible catnip, kitty keeps coming back for more. Buy 1 get 1 FREE Now for only $19.95 plus you’ll receive the Bonus Gift absolutely FREE! I do believe that my cats claws have been manicured and remain dull compared to their condition prior to their new scratching post. My Emery Cat Review has to be a positive one because my cats seem to like it, I dont have to clip their claws which saves me money at the vet, and I havent noticed any new damage to my furniture or door frames.